Dream of every student is to fare better and be on Top. For being on top a student has to be maximally updated. He cannot lag behind as far as developments in medical sciences are concerned. There are many new drugs, new translocations, new genetic mutations, new protocols, new chemotherapeutic regimes developed. It is indispensable for students to have them in mind. NEET Pg exams are updated. A better NEET student should be well prepared. Questions on the latest and newer topics are asked frequently and form the basis of a large number of questions asked. (NEET PG Pharmacology ) Lapatinib is an orally active chemotherapeutic agent used mostly for treatment of solid cancers. It is considered to be a dual inhibitor of tyrosine kinase enzyme domains. It blocks HER2 and EGFR. (NEET-PG Pathology ) Fanconi anemia is a genetic disease that affects children and adults. It is a DNA repair defect. FA is primarily an autosomal recessive genetic disorder. Differentiate it from Fanconis Syndrome. (NEET-PG Medicine ) Brown tumors are tumors of bone that arise as a result of excess osteoclastic activity, such as Hyperparathyroidism, and consist of fibrous tissue, woven bone and supporting vasculature, but no matrix. They are radiolucent on X-ray. (NEET-PG Medicine ) Geftinib is an EGFR domain inhibitor of tyrosine kinase and is used to treat those patients of non-small cell lung cancer who have not responded to other drugs. (NEET-PG Pediatrics ) Fifth Disease: also called as Erythema infectiosum is due to Parvovirus B-19. The rash of fifth disease is typically described as “slapped cheeks,” with erythema across the cheeks and sparing the nasolabial folds, forehead, and mouth. These rashes can last for up to 5 weeks and are worse after sun exposure, exercise, or hot baths. (NEET-PG Surgery ) Schatzki rings: These rings are usually mucosal rings rather than muscular rings, and are located near the gastroesophageal junction at the squamocolumnar junction. (NEET-PG Pediatrics ) Hydrops Fetalis: Parvovirus infection in pregnant women is associated with hydrops fetalis due to severe fetal anemia, sometimes leading to miscarriage or stillbirth. Med exams provide a real insight into the Latest and Newer Topics. 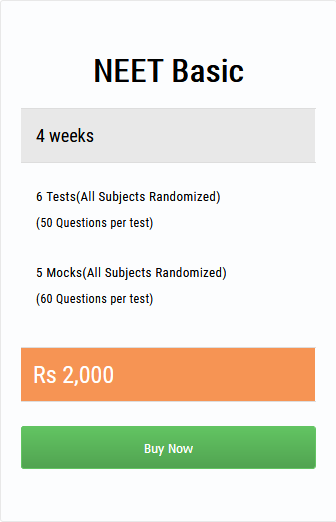 Online exams, Tests, mocks are an important part of preparation. Try the best online NEET PG site where students are benefitted greatly.